For kicking attacks, the targets do vary slightly depending upon the kick. 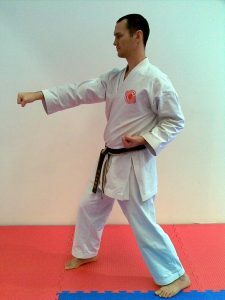 But as a general guide, chudan for kicks tends to be a bit lower than the target for punching. 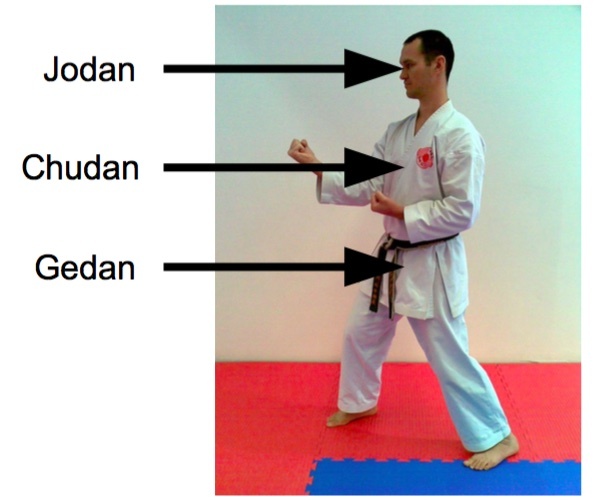 Based on the picture above, chudan for most types of kicks would fall almost in the middle of the chudan and gedan targets for punching, about the height of your hips. 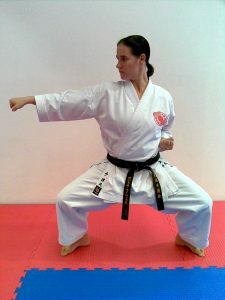 The gedan target for kicks also varies depending upon the kick, covering a range between the groin and the knee. 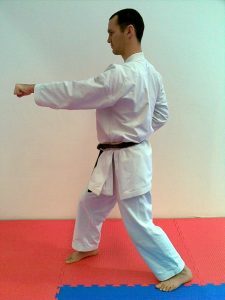 This example shows the start from an existing block. 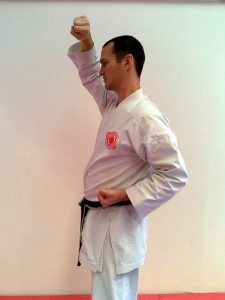 Bring your blocking hand across your body with your palm facing up. Raise your blocking hand on the outside of your pull back hand. 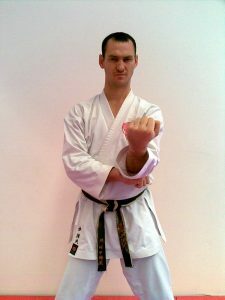 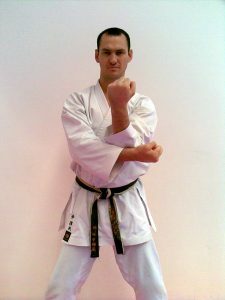 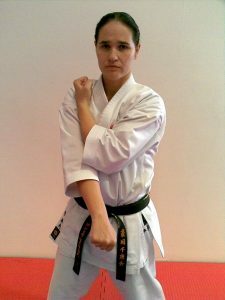 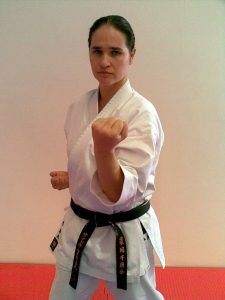 Finish your jodan uke, twisting your forearm at the end until your palm is facing out, finishing with your fist higher than your elbow and your wrist in front of your forehead. Side view [pictured right] – finish with a gap of about one fist between your wrist and your forehead. 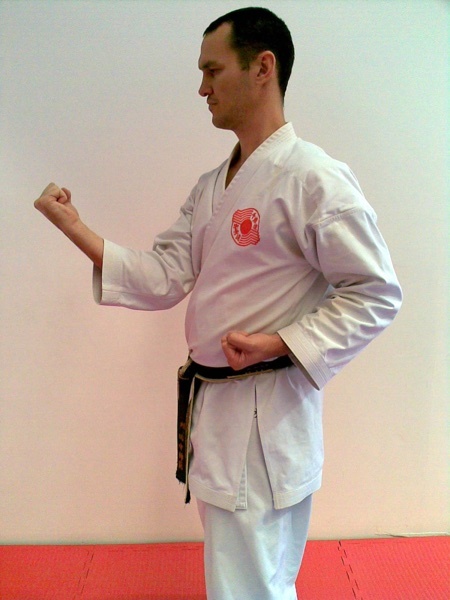 Bring your blocking hand across your body until the back of your hand reaches the elbow of the existing block. Keep your elbow where it is, slide your new block up the outside of the existing block and twist your forearm until your palm faces you at the end point. 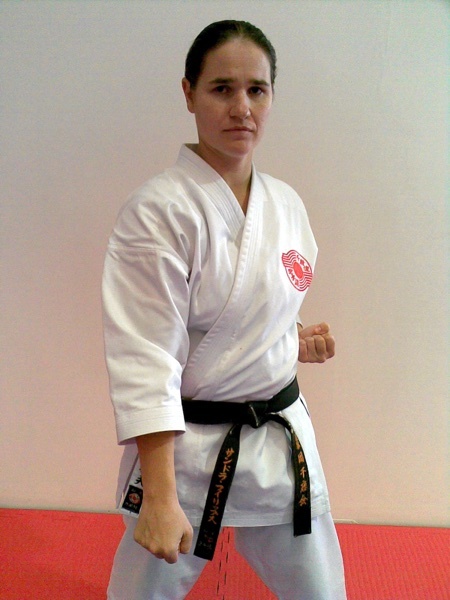 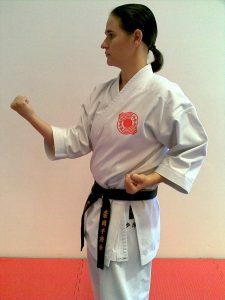 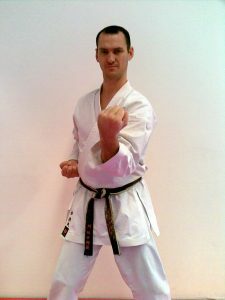 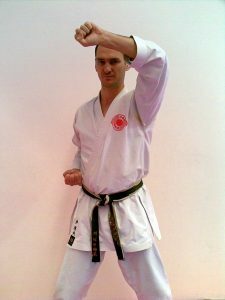 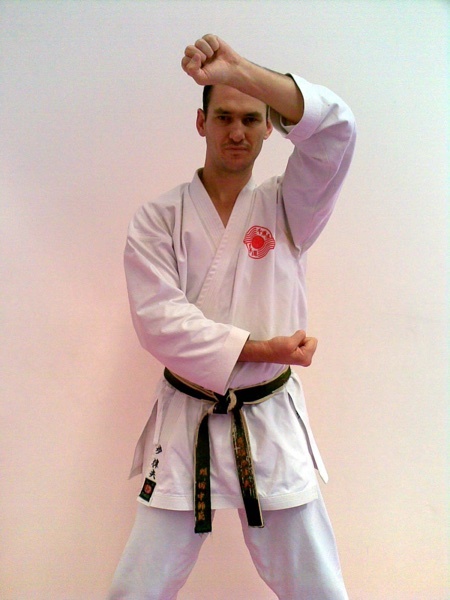 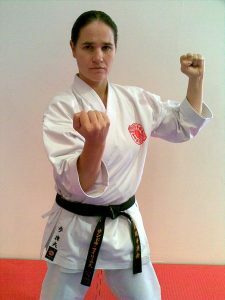 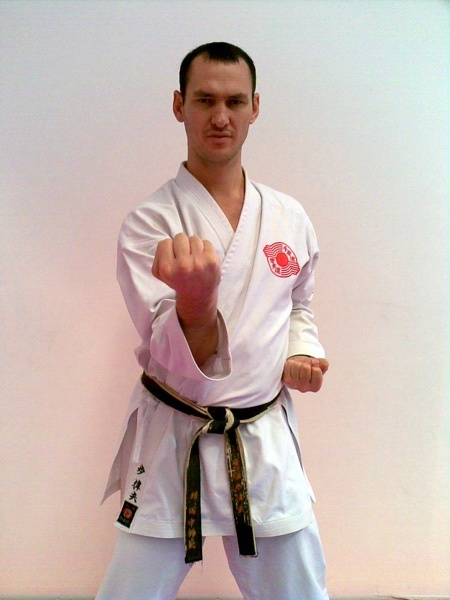 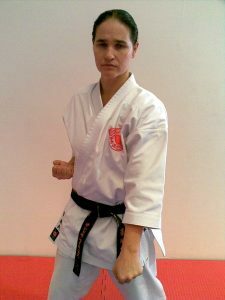 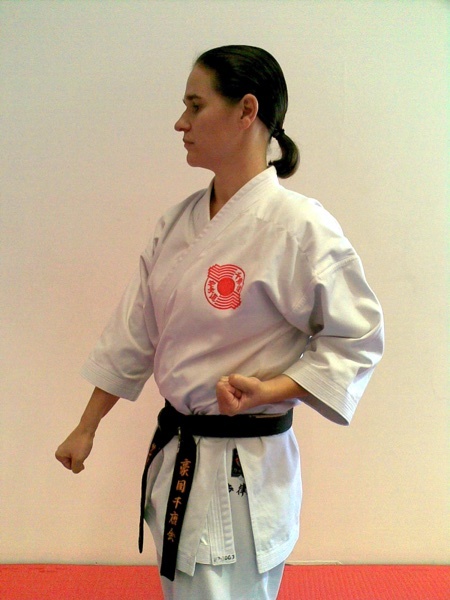 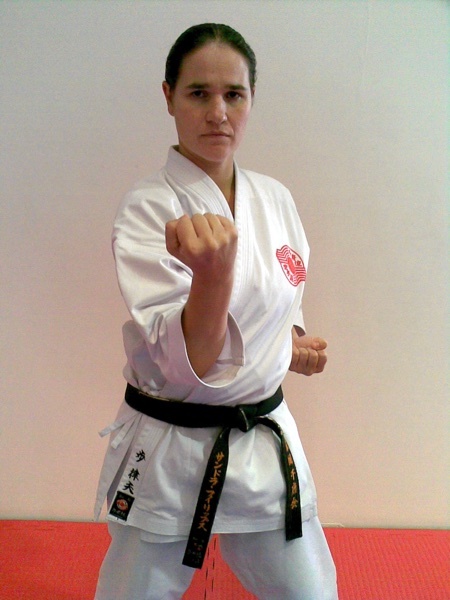 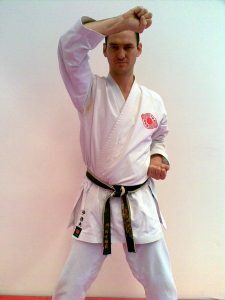 Side view – finish with a gap of about one fist between your elbow and your body and an angle of about 100° at your elbow (wrist at chudan height). 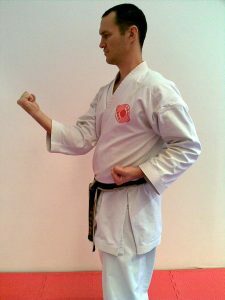 A simple routine to practice the basics punching and blocking techniques. Performed by: Hiroshi Tanaka, Renshi, 6th Dan. (June 2016).